Motorized Variable Two Wheels Attenuators 10MWA168 consists of two filter wheels. Each wheel contains eight filter mounts of ØD mm with clear aperture of Ød mm. Each mount is inclined by 4 degrees to prevent mutual reflections between filters. We supply the attenuator 10MWA168-20 with a standard, most popular, set of filters. See the table below. Alternatively, optics could be manufactured to individual orders. Or we could supply the attenuator without filters, which you can fit by yourself. 10MWA168-1 model comes WITHOUT filters. 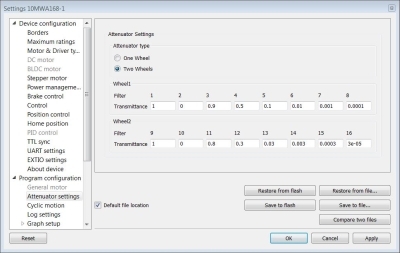 You bring a filter of each wheel into the optical path easily by hand or using automation. A single step motor drives the two wheels. A computer can operate the filter attenuator via a controller. Controllers are sold separately. For fastening, the attenuator has clearance slots for M6 and M4 screws. There are also two M6 holes, and one M4 hole (opposite to one of the M6 holes). Material: black anodized aluminium. Software Xilab Software XiLab used with controller 8SMC5-USB has integrated filter wheel control functionality designed to control STANDA motorized filter attenuators. Motorized filter attenuators can be used in all kinds of optical circuitry where variable transmittance has to be achieved. Program allows you to easily change transmittance in attenuators 10MWA168, 10MCWA168 and 8MRU-1-WA. 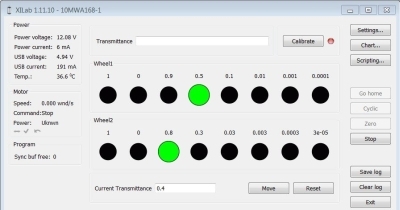 Just enter transmittance value, and the program will select the most suitable filters. Or you can select the filters directly. The simple interface allows you to use the program right away. All of our software works only with our controllers. Controller software can be downloaded for the majority of operating systems, e.g., Windows, Mac OS X, Linux etc.